The Bushnell Bone Collector Laser Rangefinder delivers accurate range performance to +/- one yard. Range to a deer as far as 200 yards/182 meters out, or to a tree 400 yards/366 meters away for a reference point. The single button operation allows outdoor enthusiasts to easily measure distance with confidence. The Bushnell Bone Collector Laser Rangefinder delivers accurate range performance to +/- one yard. Range to a deer as far as 200 yards/182 meters out, or to a tree 400 yards/366 meters away for a reference point. The single button operation allows outdoor enthusiasts to easily measure distance with confidence. 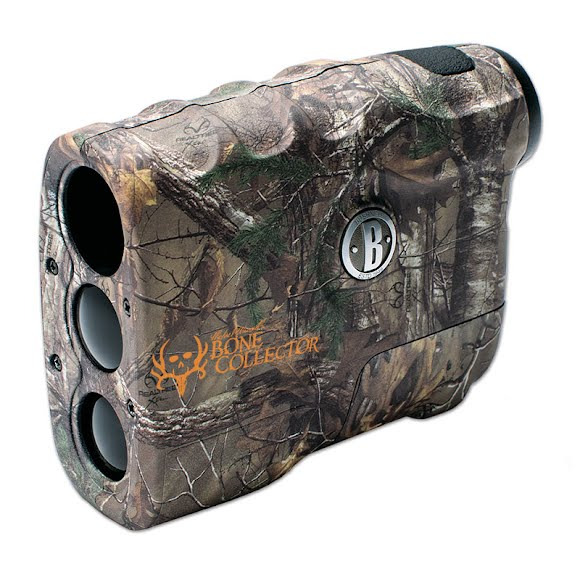 The Bushnell Bone Collector Laser Rangefinder emits invisible, eyesafe, infrared energy pulses. Digital technology instantaneously calculates distances by measuring the time it takes for each pulse to travel from the rangefinder, to the target, and back. Dimensions 1.4 x 3.8 x 2.9 in. Very happy with the product and the service will be happy to purchase on you again.